Despite claiming to be a work on ‘how a team hit a wall and burst into flames’, this book is not, in its entirety, about the events surrounding the use of sandpaper to rough up a cricket ball. I recall saying something similar about Gideon Haigh’s work on the same topic. Whilst Haigh, though, looked at the wider structural problems that permeated Australian cricket, Lemon has provided more of a record of the past season. There are five chapters, for example, on the previous Ashes series, and we have to wait until a third of the way into the volume before we get to South Africa. There are the obvious profiles of the main protagonists. In less than five years, Steve Smith had made 23 Test centuries, equalling Pietersen and Javed; bettering Hammond and de Villiers while catching Richards. The author has no doubt that he was the best Test batter in the world, and still only half way through his career. David Warner is described as one of the most complicated humans in history. He is contrasted as thoughtful and more intelligent than credited, with being objectionable and wounding. Former New Zealand batter Martin Crowe claimed he was the most juvenile cricketer to grace a cricket field. Yet, he acted as de-facto shop steward in a dispute between players and Board and is known to be sympathetic to the plight of Australia’s indigenous population. Warner is painted as the villain-of-the-piece. He is considered the ‘mastermind’ behind the ball-tampering. 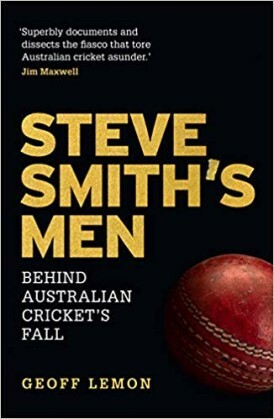 This impacts on Smith’s leadership, which is so weak it borders on the ‘homeopathic.’ By not shutting down Warner’s handiwork, Smith allowed his most junior player, Cameron Bancroft, to take the risk and for himself to be viewed as someone who either couldn’t lay down the law or who didn’t know what the law should be. Alongside this, Lemon considers wider reactions to Warner comparing an Ashes contest as war, to England captain Alastair Cook’s observation in 2013 that ‘on the pitch it’s pretty much a war.’ Warner and Smith were suspended from an IPL that is itself subject to corruption scandals and power struggles, whilst the street-brawling Ben Stokes, was allowed to play on. The South Africans had been caught ball-tampering three times between 2013 and 2016; Sri Lanka’s Dasun Shanaka just four months before Cape Town. None of the guilty received more than a fine. Numerous players have admitted to altering the ball for advantage, while Mike Brearley argued that it was almost accepted and not considered a terrible crime. Yet, no Australian cricketer had before been charged with ball tampering. Coach Darren Lehmann proclaimed his innocence but had to resign accepting that the team was made in his image. This was evident before the 2013-14 Ashes when he had urged supporters to target Stuart Broad for refusing to walk in a previous series: ‘I hope he cries and goes home.’ It was also evident in his encouraging of Warner’s aggressiveness on the field of play. This, though, was part of a broader culture. Sledging, for example, was part of an attitude that Australia ‘deserved to win, deserved to dominate, deserved to do whatever it wanted.’ Steve Waugh talked of ‘mental disintegration’ as a deliberate part of his strategy. His brother, a selector alongside Lehman, Greg Chappell and Trevor Hohns, said after the sandpaper bust that he didn’t see this team as any different to those from previous eras. Public scientist Mark West noted that of the four selectors, one took money from bookies, one ordered the underarm incident, one broke the South African apartheid ban and the other was charged with racial abuse. It is difficult not to compare this book with Gideon Haigh’s on the same subject. Whilst Haigh’s style is more akin to a comment writer in a broadsheet, Lemon is more the cricket reporter. His analysis of the wider structural issues is evident but not as central, but despite the filler in the first third of the book, this volume remains a valuable contribution to a dark day in Australian sport. A.A. Thomson was the favourite author of Sir Donald Bradman. The Don only liked the best of cricketers and his choice in writers was also of the elite.